This week my main focus has been on making my entire operation more efficient. One of the biggest time wasters of all is being disorganized, which is something I struggle with, but I am trying very hard to change. Those of us who are not properly organized spend so much needless time and energy searching for things and continually solving problems we should have taken care of awhile ago. We have loads of repetitive tasks that we could put on auto-pilot, but haven’t taken the measures to create a system to handle this. I’m too busy to stop what I’m doing to try and become organized! This is my best excuse, and while it’s sorta true, we all have the capability to make time. Getting organized is not something that can -or needs to- happen overnight, but if you devote a little bit of time to it each day, eventually you’ll get there. Whether it be sorting through email, organizing receipts, cleaning a kitchen pantry, or whatever…we can all find some way to squeeze in 15 to 30 minutes per day to work on becoming more organized. 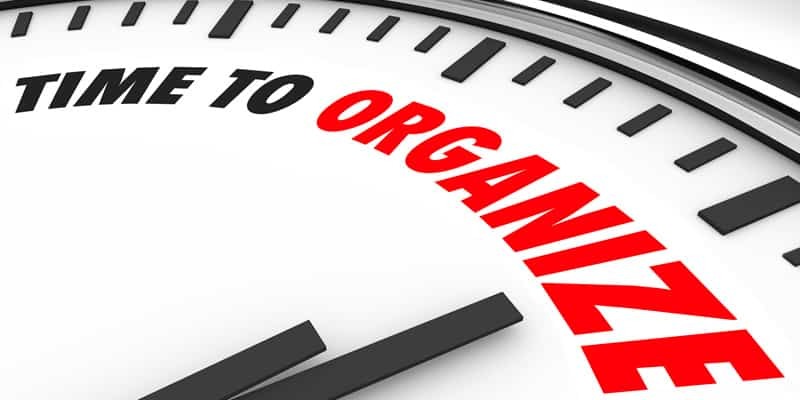 In keeping with the above excuse, staying organized also requires a bit of time and effort each day, but whatever time is spent trying to maintain organization is but a fraction of the time you’d waste operating in a continuous state of disarray. …had you been more organized. This is something I have become better at doing, but I still can use some work. Some of us may think that our minds are a steel trap and that we have an innate ability to properly prioritize, yet the fact is, we can’t work efficiently that way. As our lives become busier, we have to offload all of the incoming information, tasks and responsibilities, and then inventory that stuff. It’s important to always record (e.g., write down) important information when it comes in, then assess it accordingly. For example…a few weeks back I had intended to send a birthday card to an aunt, but had forgotten her exact birthday. I asked my dad to give me that info, which he did, but I neglected to enter the details into my phone right then and there, thinking…”oh, I can remember that…” Well guess what… negligent nephew blew it big time and had lots of apologizin’ to do! That’s a bad space to be in, and having those moments of anxiety each and every day dilutes your focus and saps your energy. One of the things I’ve been meaning to do is organize my hosting situation. I have certain services which I’m overpaying for, services which are being underused, and other services I need to discontinue. For months I’ve been dragging my feet on this stuff, and as a result, it’s cost me a lot of unnecessary time and money. Another item on my list involves an audit of all my abandoned or neglected affiliate sites. I’ve already made good strides here, which I’ll go into in a future post. Provided the site has at least some value, nothing says ‘leaving money on the table’ quite like a neglected affiliate site. So, I’m assessing and auditing all of my sites, and will be resurrecting and refreshing the ones that are worth continuing. I’m also aggregating them all into one manageable dashboard for maintenance and updates, which is another topic I’ll get into shortly. The tool I’m using to do this is ManageWP, and just as an example as to how scattered I’ve been prior to now, I’ve had the service for over a year and have barely used it. What a waste of time and money that’s been. Using ManageWP to update, maintain, backup and optimize multiple WP installations makes life so much easier. Major fail on my part for not having taken full advantage of this sooner.